We have found a wonderful quilt to make for Block of the Month project in our Sew WhatEver 2019 class. This quilt has colorful traditional blocks pieced in a simple and precise way. 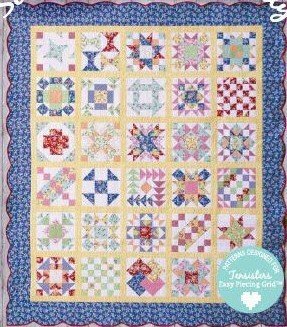 We are excited to present to you the "Ten Sisters Sampler" quilt by Carmen Geddes. This quilt uses her wonderful "Easy Piecing Grid" method of assembly that simplifies these blocks for your enjoyment. We will have kits available to make this quilt. For those doing the Block of the Month, we are adding an exciting twist. On the second Wednesday of each month (during class), we will be giving you the opportunity to sign up and pay a one-time fee of $15 to receive the "Golden Ticket"! With this Golden Ticket, on each second Wednesday you will receive 20 percent off of patterns, notions, BERNINA accessories ($300 and under) and all hoops. This is part of joining with BERNINA in celebrating its 125th anniversary, so join the Golden Excitement and sign up now!